The theme of Homesteading for the 2010 reunion at Doane College, Crete, Nebraska, was announced at the 2008 reunion. 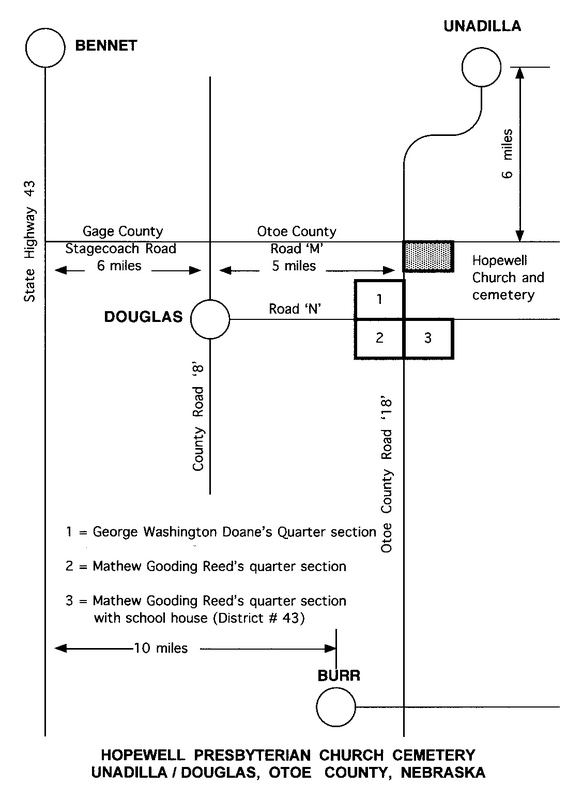 My husband and I suggested a presentation of homesteading about two of my Great Grandfathers who homesteaded across the road from each other at Otoe County, Nebraska - George Washington Doane and Matthew Gooding Reed. Their farms were located one mile due south of Hopewell Presbyterian Church, and less than 40 miles east of Doane College. 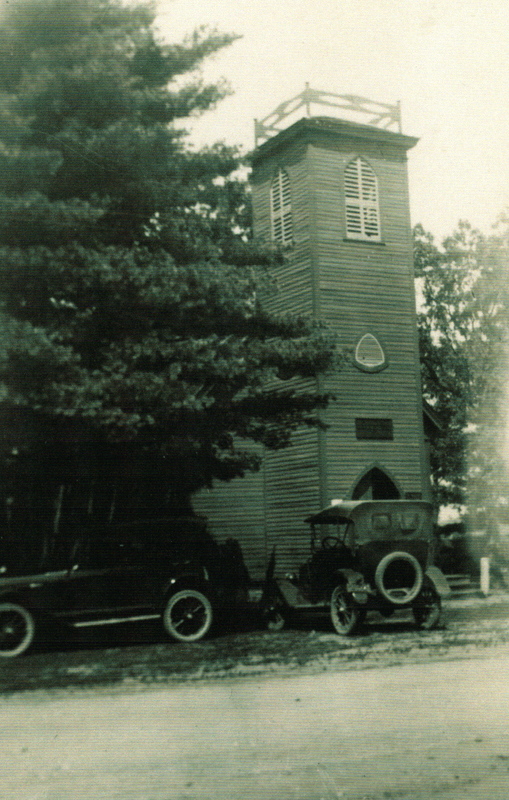 We suggested a tour to the area of the homesteads and the church on the following day, and the reunion committee arranged the tour to these areas including a reception at the Hopewell Church. Matthew and Ruth Ann Reed's daughter, Jane, married Arthur, the son of George and Frances Lucinda Doane. I was born at Edgar, Nebraska, and I graduated from Harvard High School in Clay County. 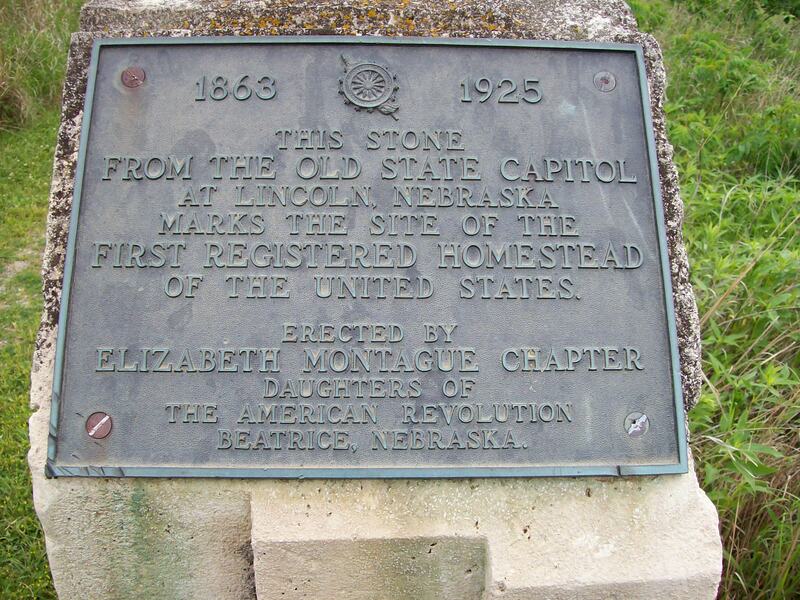 The Homestead Act is probably the most familiar of the various laws under which public land was acquired in Nebraska. 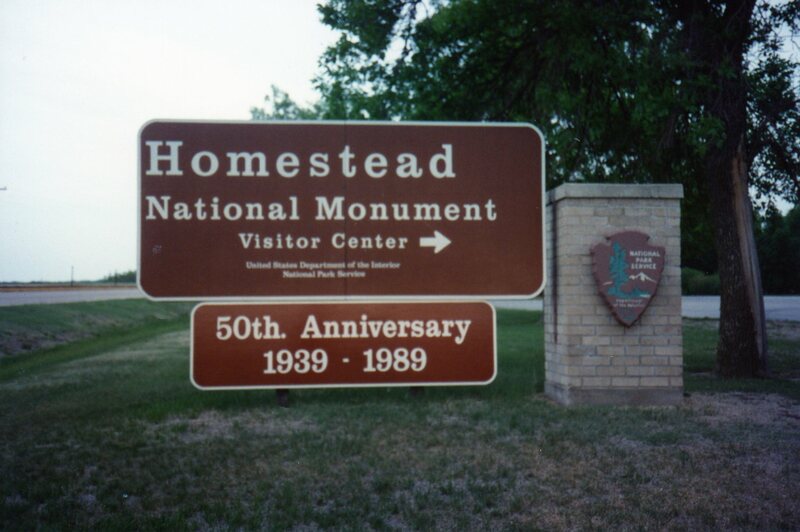 Its effective date was January 1, 1863, and the Homestead National Monument near Beatrice, Nebraska, commemorates the site for the “first” homestead. The Homestead Act was designed to make land available "free" to those who would live on and cultivate a tract for a period of time, usually five years. Though the filing provisions were similar to the pre-emption requirements, there was no per-acre payment required for the land itself. An individual meeting certain requirements could claim up to 160 acres and not less than forty acres of available public land. Some patents have the word "Pre-emption "in the upper left-hand corner. "Pre-emption" was a tactful way of saying "squatter". 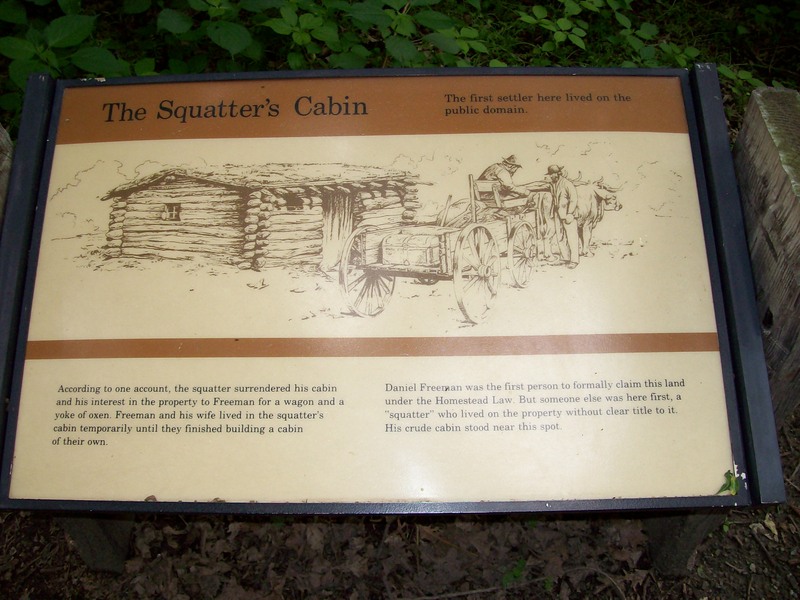 In other words, the settler was physically on the property before the Government Land Office officially sold or even surveyed the tract, and he was thus given a pre-emptive right to acquire the land from the United States. This notice was brought to the United States sometime between 1870 and 1872. 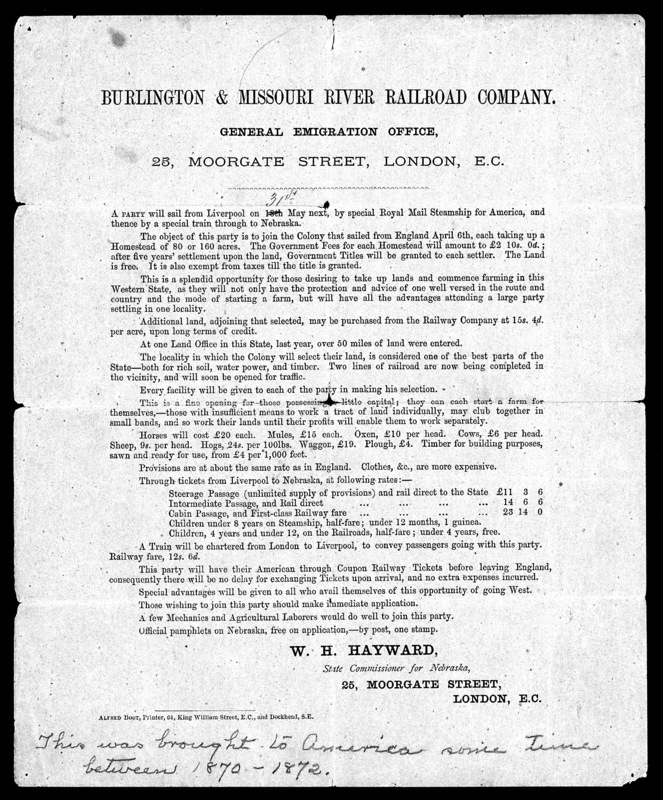 It reads in Part – “Burlington and Missouri River Railroad Company. General Immigration Office. 25 Moorgate Street, London, E. C.
A party will sail from Liverpool on 31st May next, by special Royal Mail Steamship for America, and thence by a special by train through to Nebraska. Year 1 – Live on the land and improve the land by building a 12 x 14 dwelling and grow crops. 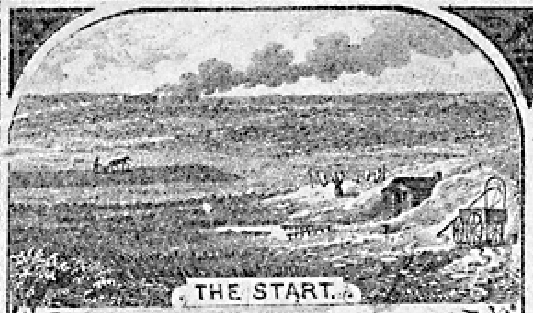 A shelter protected from the elements – The “sod house” was sometimes called a “mud house” or a “sod shack.” Generally it was of one low story with a sod roof supported by timber. 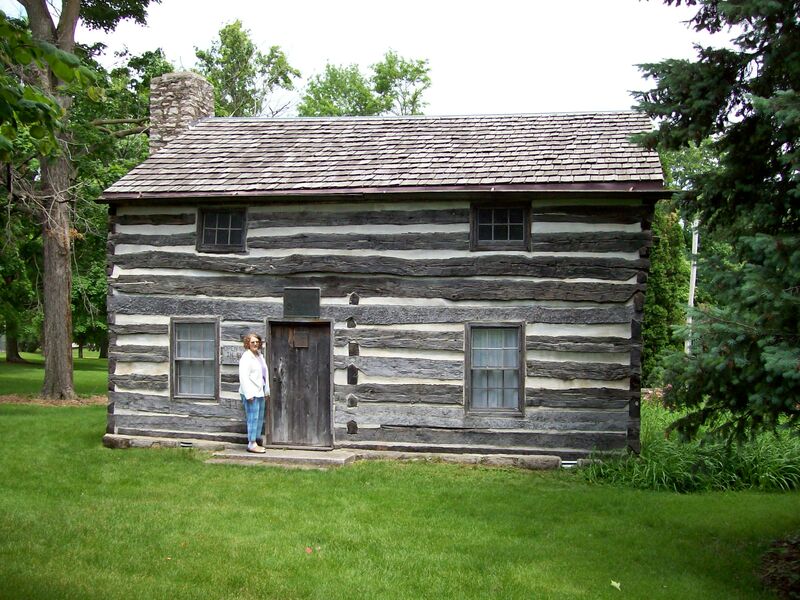 Many pioneers built such a dwelling until they had the time and perhaps the small amount of money to build a “soddie.” The floor, if not of earth, would be of “scored logs” with the bark removed and made flat and “dressed with a broad axe” to make them smooth. Year 2 – plant trees and grow crops. Year 3 – expand the tree and crop acreage and build a small house. Year 4 – increased the agricultural acreage and built a barn. Year 6 - You had to live on the land for five years and could not abandon the land for more than six months at a time. 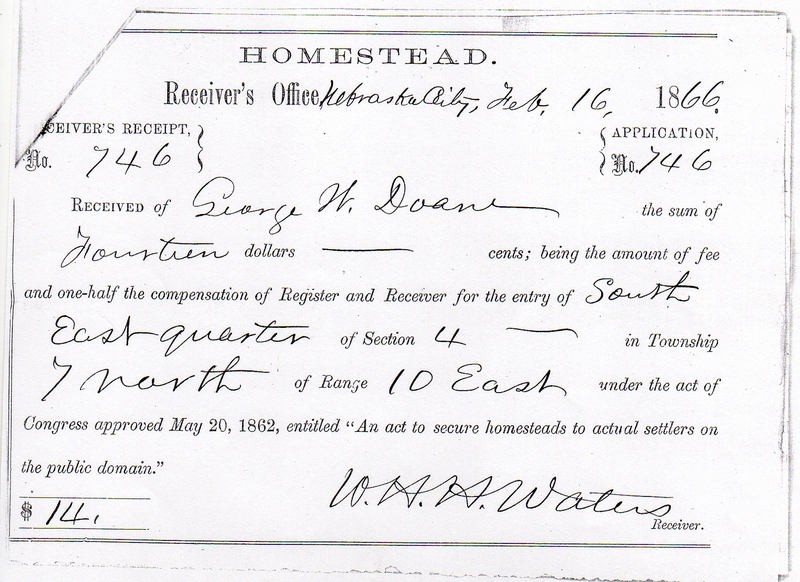 After the five-year period the homesteader could file for a patent (or deed of title) by submitting proof of residency and the required improvements to the local land office. If approved, the land was yours for a small registration fee. 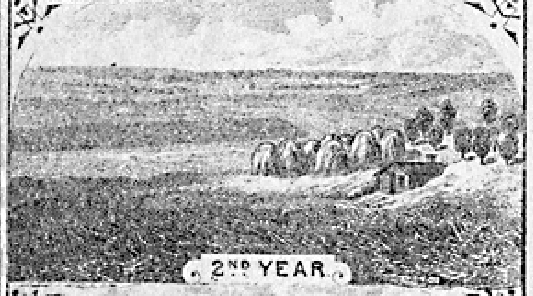 James Bordeaux, an employee of Pierre Chouteau, Jr. and Company, established this small trading house, near Chadron, in the winter of 1837-38. Bordeaux maintained this post until 1872 and carried on a successful trade with the Brule Sioux Indians. The site includes two reconstructed buildings, a combined trading house and living quarters, and a small warehouse. 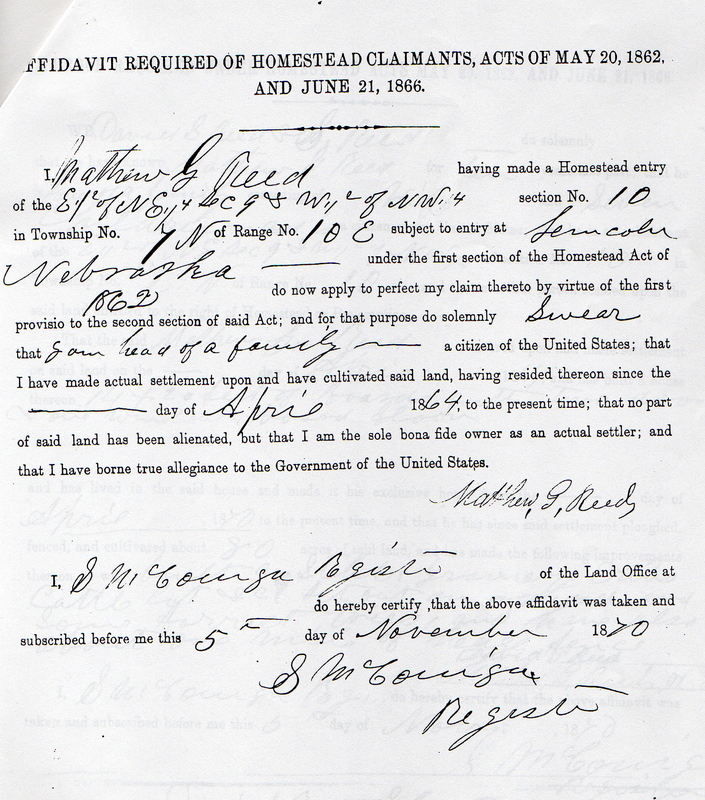 It has been estimated approximately 40 percent of the homestead applicants eventually fulfilled all the requirements of the government and earned title to their property. 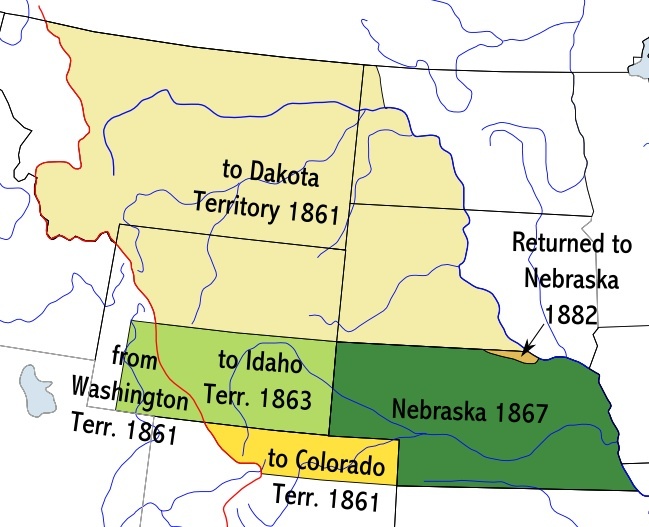 Starting with the annexation of the Northwest Territories and the State of Ohio and extending to the Pacific Ocean Townships and Ranges were created in order to easily locate one’s land grant or property acquisition. Townships are six-miles square and are either North or South of a base line. Ranges are either East or West of a principle meridian. 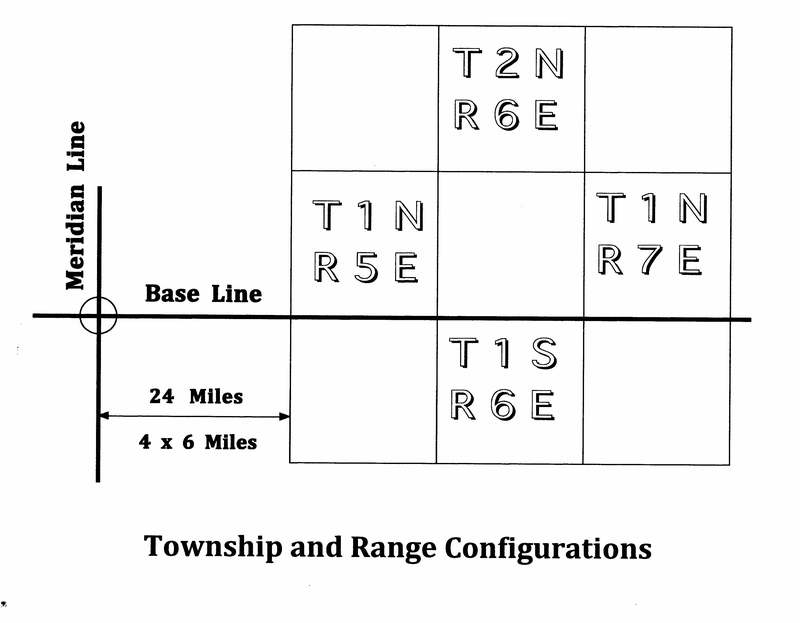 For example: Township Two North, Range Six East, Mount Diablo Base and Meridian. 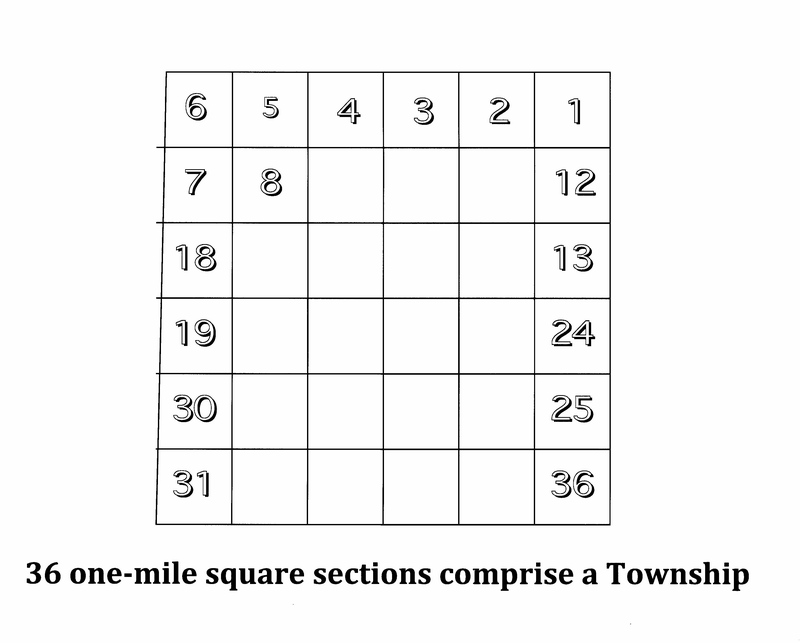 A Township is composed of 36 mile-square sections. A Section is one mile square. 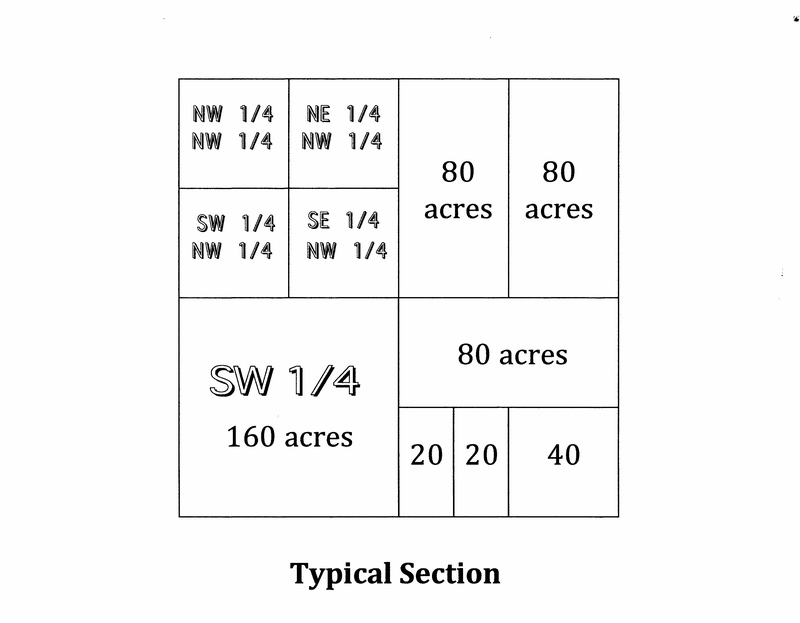 A quarter section equals 160 acres. Land can be obtained in any square or rectangular shape, and it does not have to be located in the same section or Township. 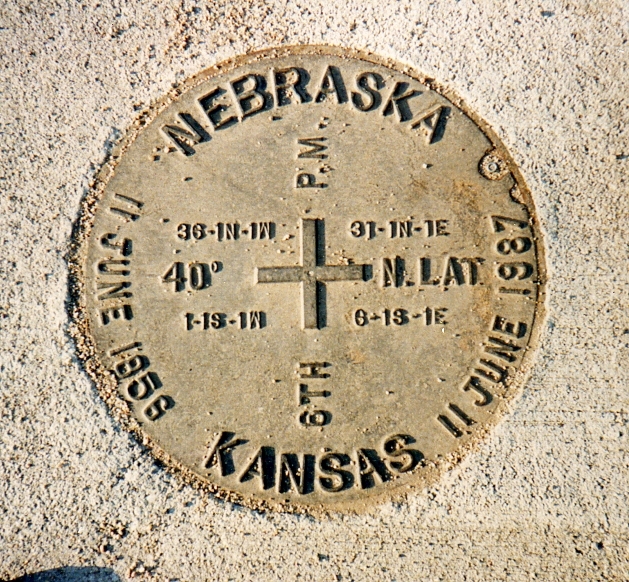 On the Kansas-Nebraska border in north central Kansas is located the surveyor's benchmark from which all property in Kansas, Nebraska, and parts of South Dakota, Wyoming, and Colorado are referenced. 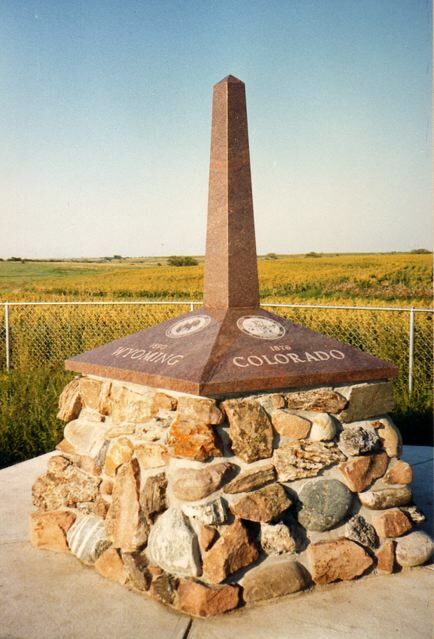 Soon after the passing of the Kansas-Nebraska Act in 1854, a survey was commissioned by the US Government so that the lands newly opened for settlement could be properly and legally plotted out for the homesteaders.† The survey was carried out by Charles Manners who started by erecting a Cast Iron Monument on the west bluff of the Missouri River in 1855 at 40 degrees North latitude--the Northern boundary of Kansas. From this point, he surveyed 108 miles west and placed a red sandstone marker at the location of the 6th Principal Meridian. The imaginary line between these two markers marked the border between the two future states. 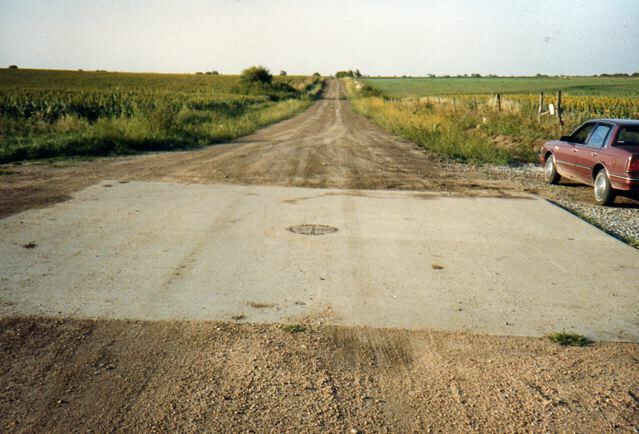 The original sandstone marker is still intact under the manhole cover in the middle of the road, though part of it has been carted of to the Kansas Museum of History in Topeka. 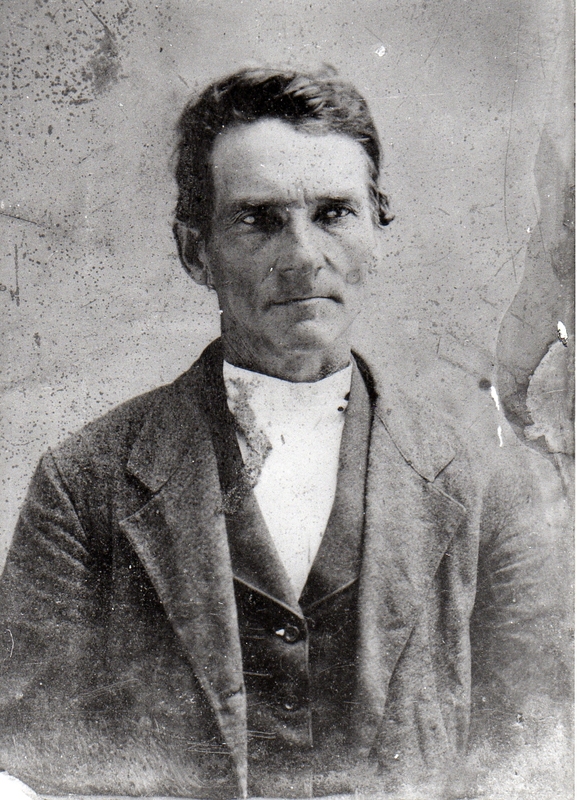 FIRST - Matthew Gooding Reed was born on 31 October 1831, near Marysville, Union County, Ohio. He was the first of ten children. His parents and grandparents removed from Fayette County in southwestern Pennsylvania in 1800. Matthew Gooding Reed was named after Matthew Gooding, a neighbor and friend of the family, who was a Justice of the Peace 1829 - 1831. 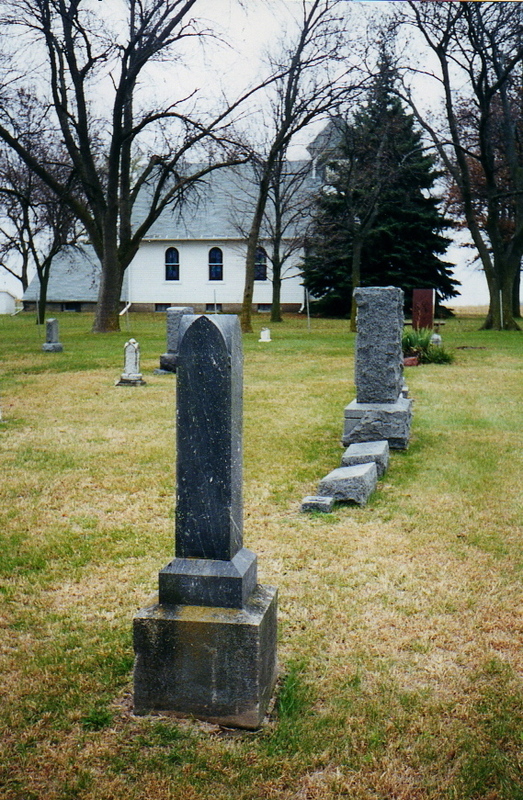 Matthew removed in 1856, at age 25, to Washington County, in southeastern Iowa. Here in Clay Township he taught school. 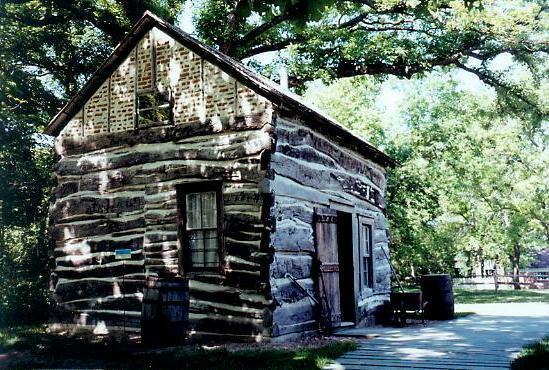 The first school in Brighton was held in a log house in the east part of town in 1840. 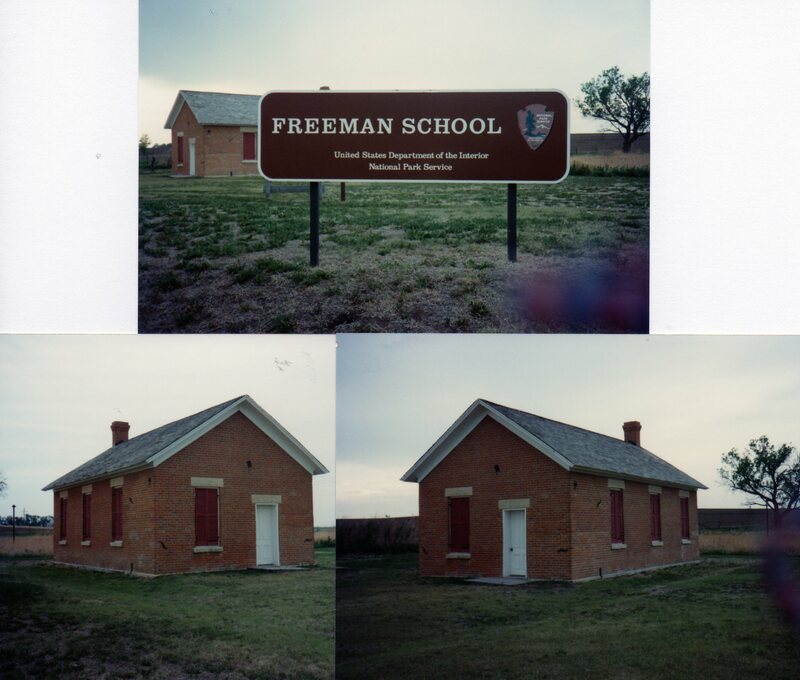 The first schoolhouse was erected the following year in the west part of town. It cost the town nothing as the whole neighborhood turned out to help for the public good. One of his students was Ruth Ann Smith. 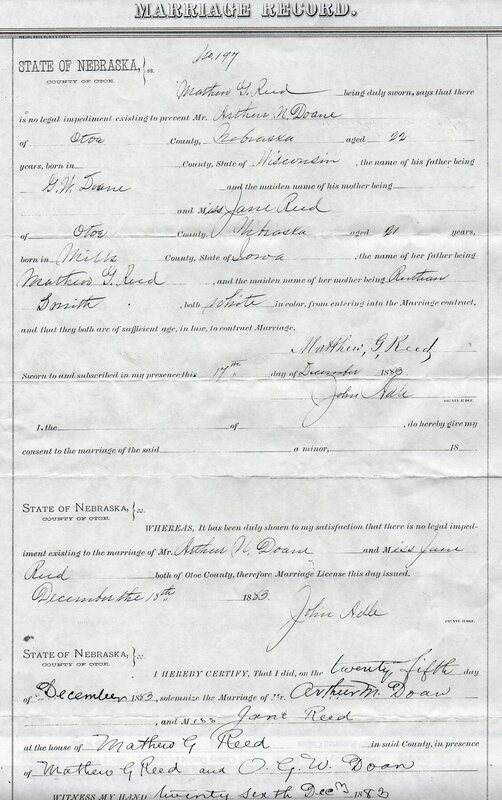 Ruth Ann was born on 04 April 1842, at Westfield, Hamilton County, Indiana, just north of Indianapolis. 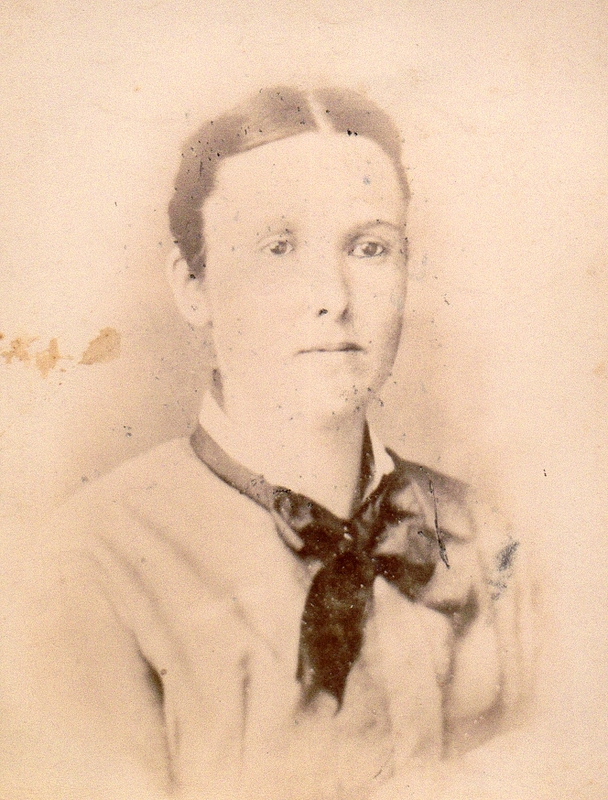 Ruth Ann, with a long ancestry of Quakers, married Matthew on 20 March 1859, at Brighton Township, Washington County, Iowa. 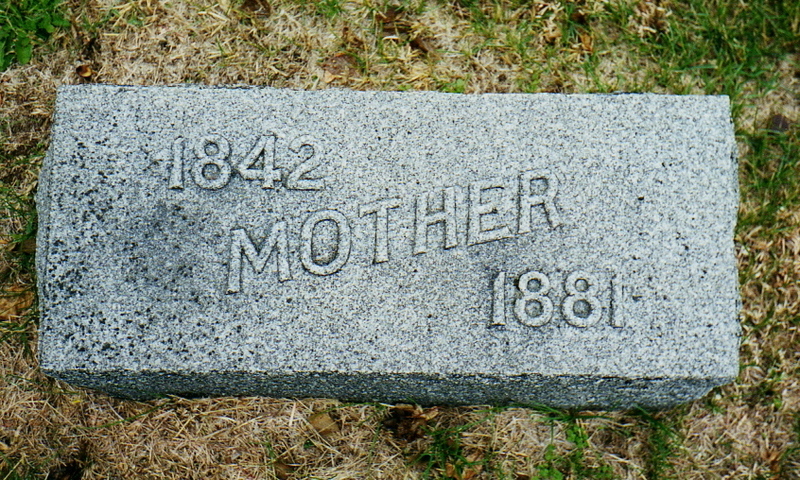 They had fourteen children between 1860 and 1881. The first was born in neighboring Keokuk County, Iowa, but the second, Jane Reed [Eunice’s Great Grandmother], was born on 06 February 1862, Hastings, Mills County, Iowa. All the remaining children were born at Otoe County, Nebraska. However, on 29 Mar 1858, Mathew secured a Military Bounty certificate, No. 73,784, for 120 acres of land from Moses Miller of Keokuk County, Iowa. 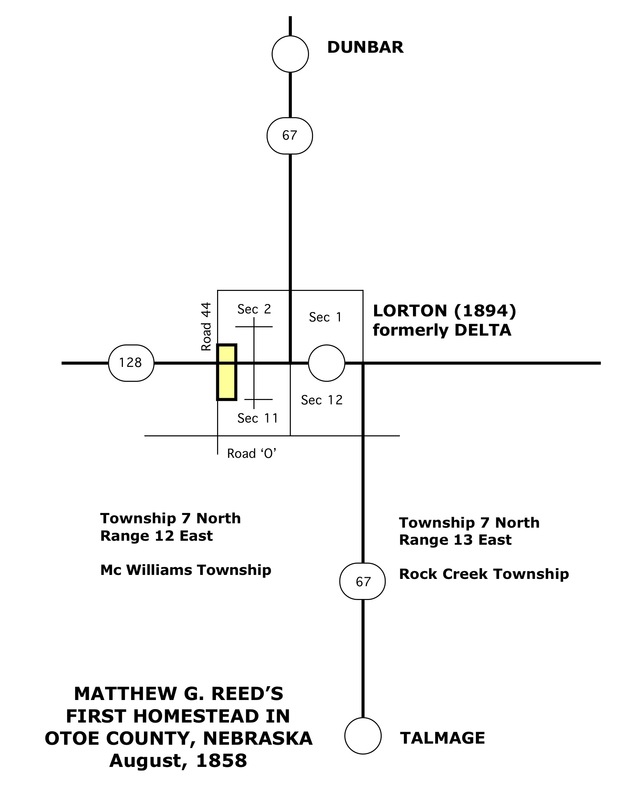 Later, on 27 Aug 1858, Matthew filed the Military Bounty right on 120 acres in Sections 11 and 2, Township 7, Range 12, which was located at Delta (now Lorton) in Otoe County, Nebraska. 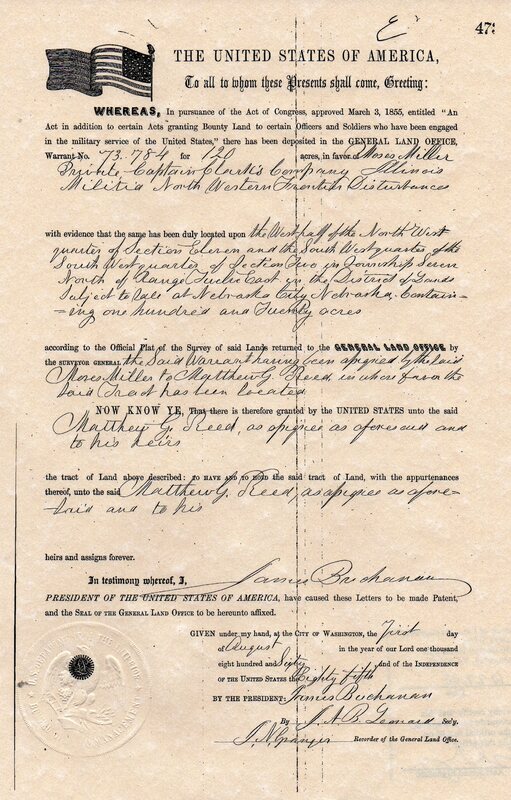 This certificate for land was originally awarded to Private Captain Moses Miller for his service with the Illinois Militia in the North Western Frontier Disturbance of the Black Hawk Indian War. Military Warrant Acts granted public land to soldiers instead of pay. 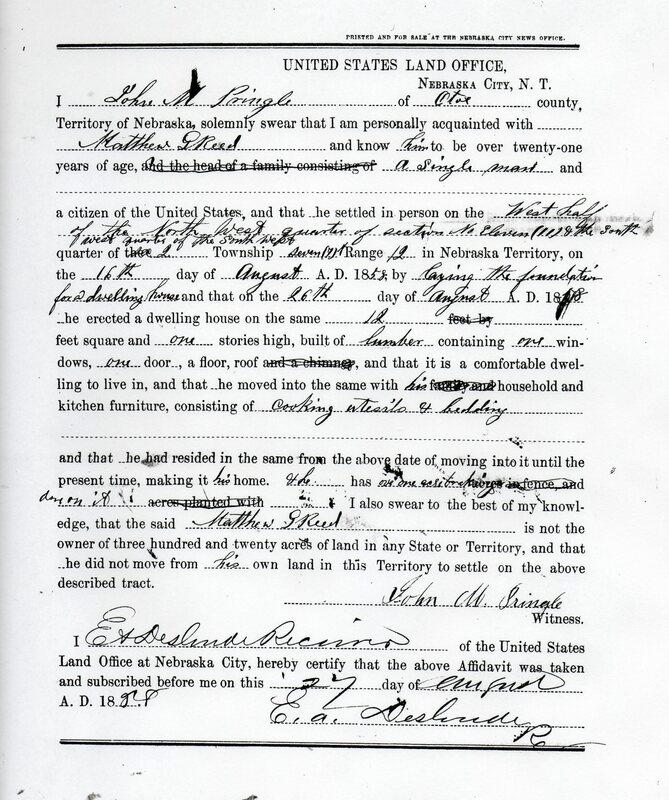 I, John M. Pringle, of Otoe county, Territory of Nebraska, solemnly swear that I am personally acquainted with Mathew G. Reed and know him to be over twenty-one years of age, and the head of a family consisting of a single man and a citizen of the United States, and that he settled in person on the West half of the North West quarter of section No. Eleven (11) & the South west quarter of the South West quarter of the 2 Township seven (7) N [north] range 12 in Nebraska Territory on the 16th day of August A.D. 1858, by laying the foundation for a dwelling house and that on the 26th day of August A.D. 1858 he erected a dwelling house on the same 12 feet square and one stories high, built of lumber containing one windows, one door, a floor, roof and a chimney, and that it is a comfortable dwelling to live in, and that he moved into the same with his family and household and kitchen furniture, consisting of cooking utensils & bedding and that he had resided in the same from the above date of moving into it until the present time, making it his home. And he has over one section breaking in fence and done on it acres planted with ____[not indicated]____. 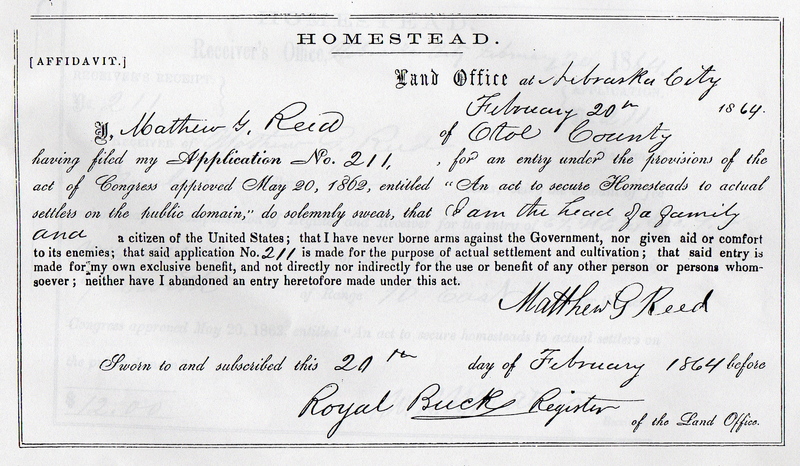 I also swear to the best of my knowledge, that the said Mathew G. Reed is not the owner of three hundred and twenty acres of land in any State of Territory, and that he did not move from his own land in this Territory to settle on the above described tract. After establishing his right to the land, he returned to Iowa to marry. Matthew and Ruth Ann, with their two daughters and their covered wagon drawn by their ox team, Dave and Darb, migrated to Nebraska in 1862. Why they did not stay here is unknown. Maybe the land appeared better in the western part of the county. 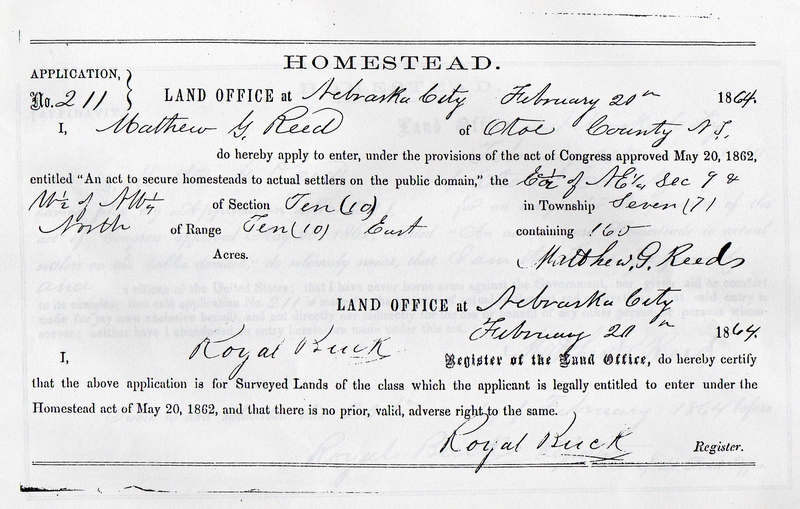 Again, on 20 Feb 1864, Matthew filed for 160-acre homestead at Nebraska City Land Office. 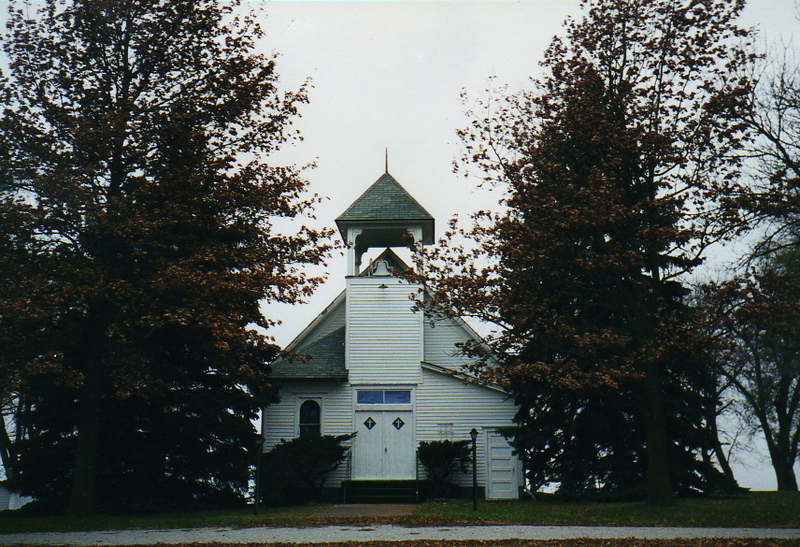 This homestead, 14 miles west of the first, was located, in Sections 9 and 10, Township 7 North, Range 10 East, is located north of Burr in Otoe County, and south of the Hopewell Church. The filing fee for Application No. 204 was $12. This homestead is fourteen miles due west of their land at Lorton. During April 1864, they dug a room in the side hill and covered it with a thatched roof to live in until they could afford a better house. The dugout also had a loft. This dugout was later used as a cellar and more rooms built over it. In 1862 he served as an election official. In October 1865 he was elected clerk of election. In February 1866 Mr. Reed was appointed commissioner to lay out a certain road and twice that year he served on the election board at two special elections. 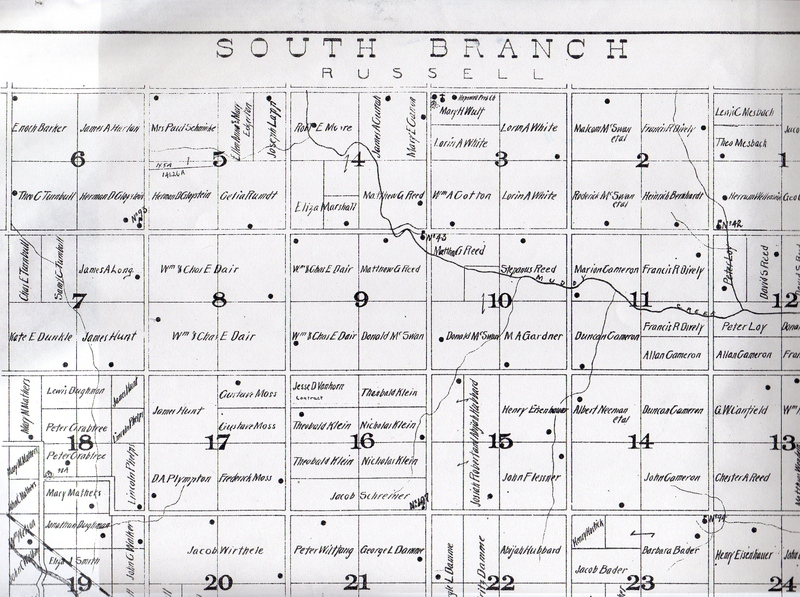 In 1867 he served as assessor, as clerk of election and was appointed several times to lay out certain roads. PATENTED to Mathew G. Reed on 10 January 1873. 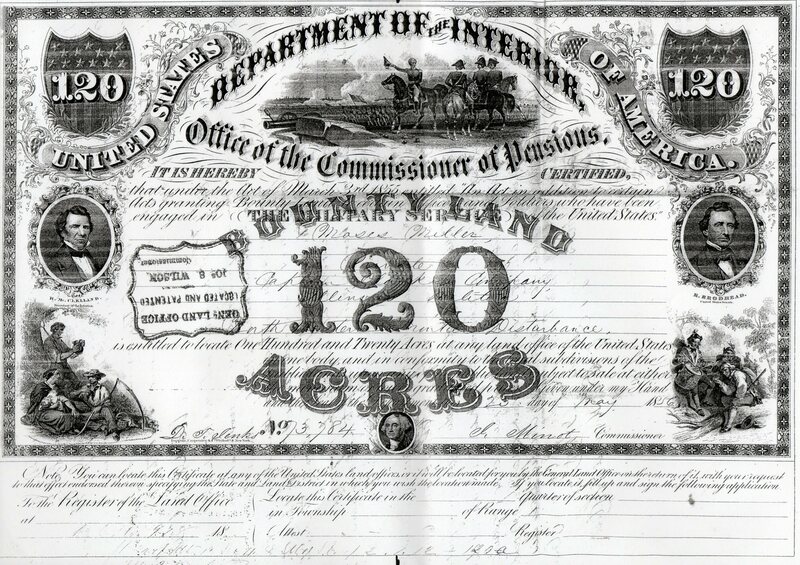 Mathew was a school teacher in 1871 for the salary of $120, 1872 at $90, 1873 at $109 and 1874 at $105. “The School District was not formed until four families had moved in. They were the Matthew Reeds, the George Washington Doane family, the Wells family and the Morris Family. “The first teacher in this school was Sarah Davis, who later married and lived in Unadilla. School board members were Matthew Reed, George Washington Doane and J. Wells. Matthew Reed and J. Wells later taught in this school. 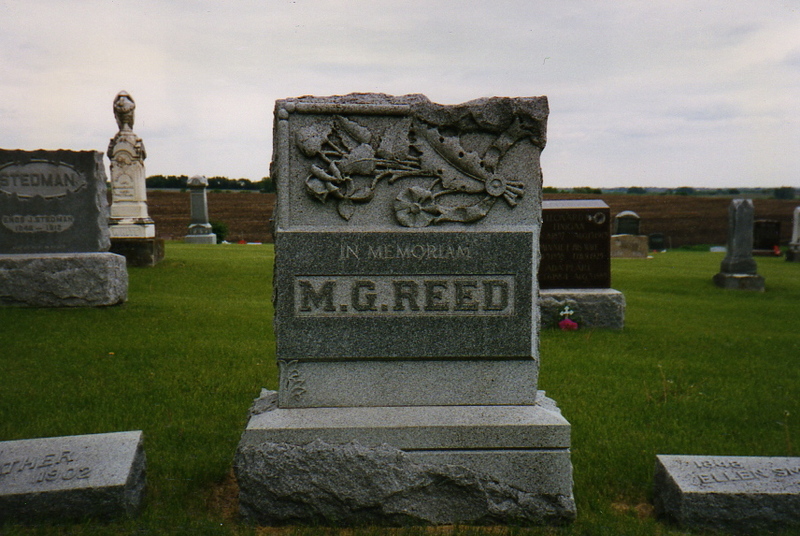 Mr. Reed was a well educated man having attended college in Ohio. He was surveyor of land for the precinct. “The first family school house built about 1880. It faced east. Benches were built around the wall with a stove in the middle of the room. The land for the building was donated by Matthew Reed. The following story was related by Dora Henderson, another Reed descendant, to Eunice Averill Brabec: Roy Reed, the 7 year old son of Matthew Gooding Reed had accidentally been shot in the foot ca 1880. The doctor had been sent for but in 3 days time the boy was near death and no doctor had arrived. M.G. Reed had his 2 oldest daughters (Alice and Jane) give the boy brandy to drink until he was very inebriated. The boy was then tied down and held by the daughters as the father amputated his son’s foot. By the time the doctor arrived 2 days later Roy was on the way to recovery. This took place in Otoe County, Nebraska, at the Reed home. Jane was to become Eunice’s Great Grandmother. 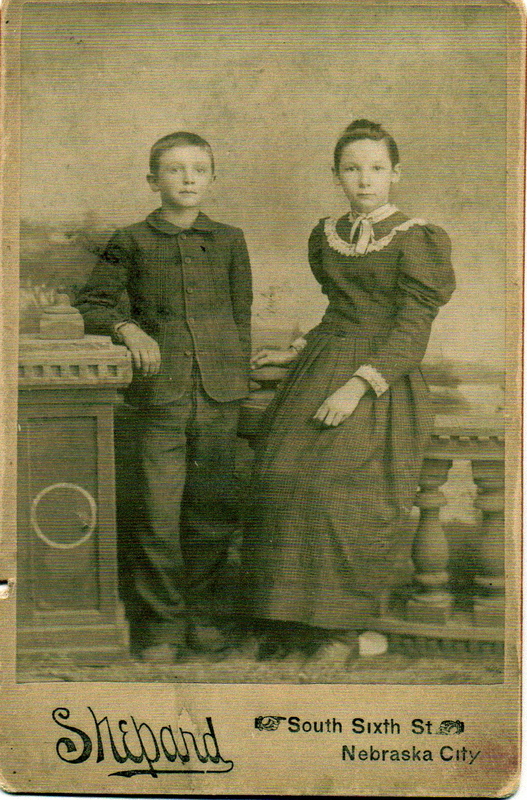 Eleven days after the birth of her fourteenth child, Ruth Ann disappeared in August 1881. MRS. REED FOUND -- The body terribly mangled by hogs. 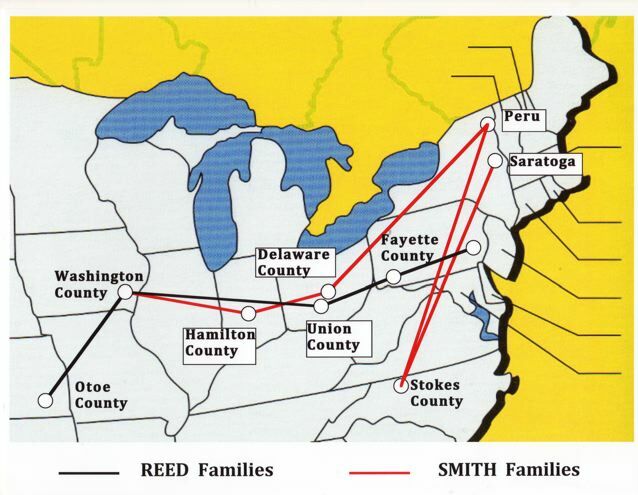 Last Monday morning, September 19, 1881, the news came to our town, that the body of Mrs. Reed, the wife of M. G. Reed, of South Branch precinct, was found about 8 miles south of Syracuse, in a corn field. Repairing to the place indicated we found the story too true. In Wm. Tangeman’s corn field in Osage precinct, a little over eight miles south of this place, there lay the mutilated remains of the unfortunate lady, who on the 21st, day of August last, in a temporary fit of insanity, wandered from her home to die in a horrible manner. 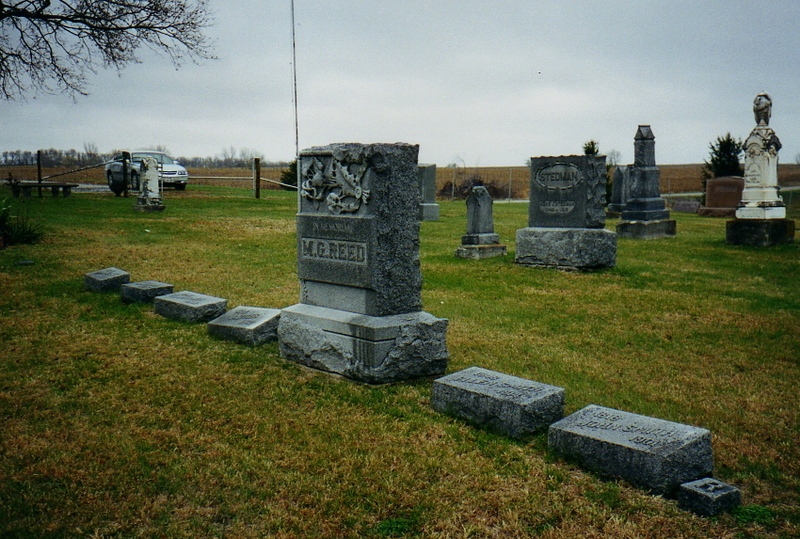 “Matthew Reed, died 15 August 1902, aged 71 years, died at his residence on the Muddy Creek in South Branch precinct last Friday, and he was buried at Hopewell cemetery Sunday. He leaves a wife and twelve children to mourn him. “The deceased came with his brother, David, from Ohio and settled on the Muddy Creek in 1861, and continuously lived in the county since. 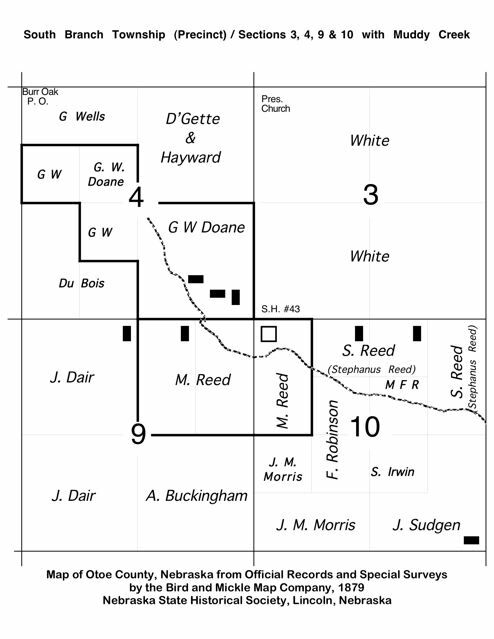 In the early days he was county surveyor and a prominent man among Otoe county people. He leaves his family in comfortable circumstances. 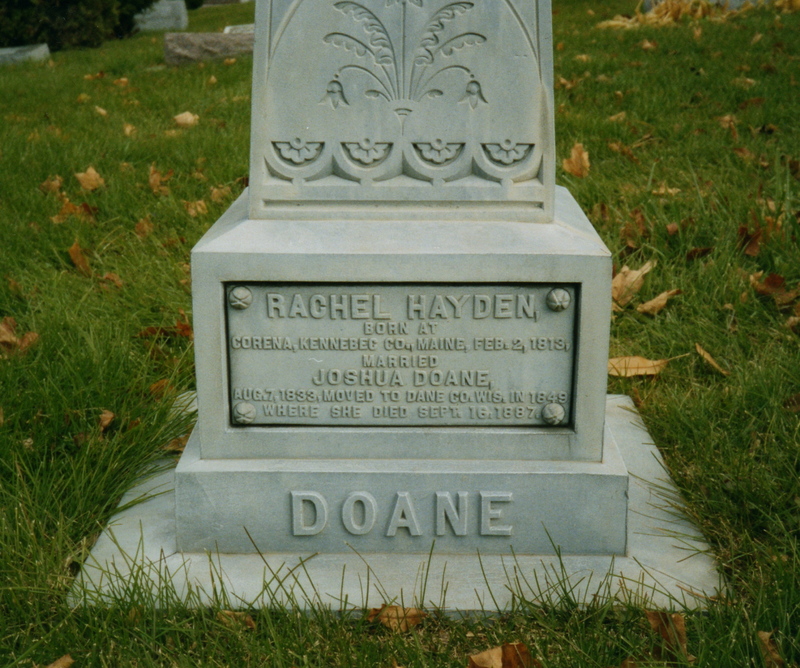 George Washington Doane (#751) was a child of Joshua Doane and Rachel Hayden. Joshua (#258) is the fifth descendant from Deacon John Doane. The lineage is as follows: Deacon John, Ephriam, Ebenezer (1), Ebenezer (2) and Ebenezer (3). Ebenezer Done (2) removed from the Cape to Maine about 1739. Joshua, the eighth of ten children of Ebenezer (3) and Joanna Millet, was born 06 December 1807 at either Canan or Lowell, Maine. 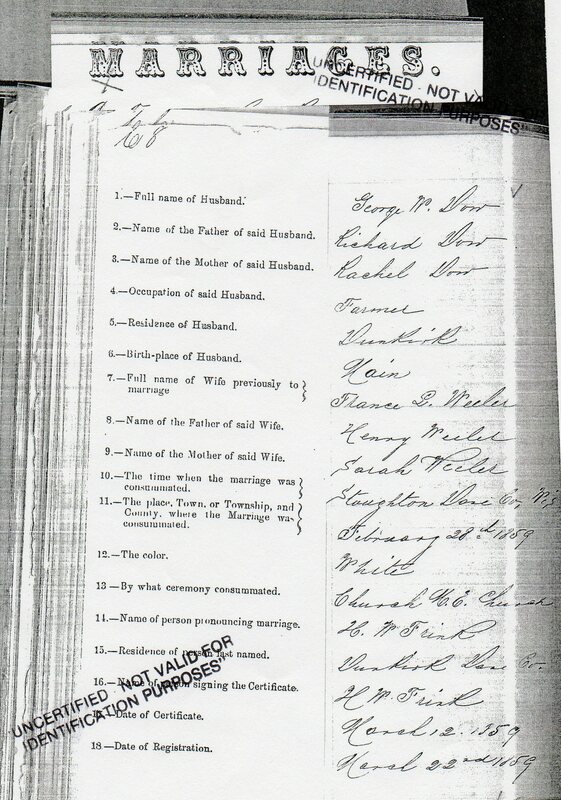 Joshua married Rachel Hayden on 07 August 1833 at Lowell, Massachusetts, Rachel was born 02 February 1813, at Corena, Kennebec County, Maine. They had possibly ten children of which George Washington was the third. George was born on 04 December 1837. Joshua was a mechanic, but he never learned a trade. He had an iron constitution and cleared up two heavily timbered farms in Maine. 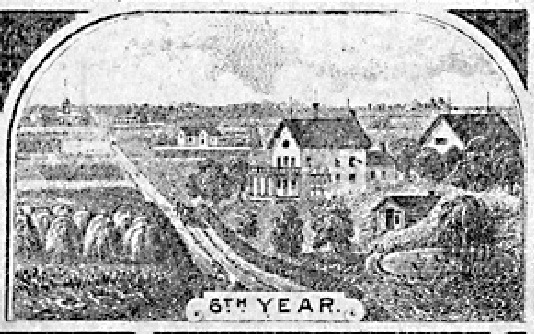 The family resided in Maine until 1849, when the family removed to Dane County, Wisconsin. 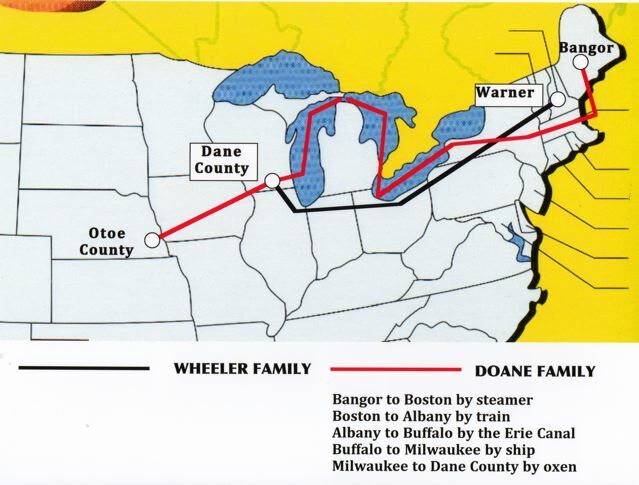 They made the trip via steamer from Bangor to Boston, then by rail to Albany, then by canal to Buffalo, then by the Lakes to Milwaukee, where they took an ox team and finished the trip to Dane County. At that time this section of country was but little improved, and most of the land was owned by the Government. As there were no railroads, Milwaukee was the nearest market. 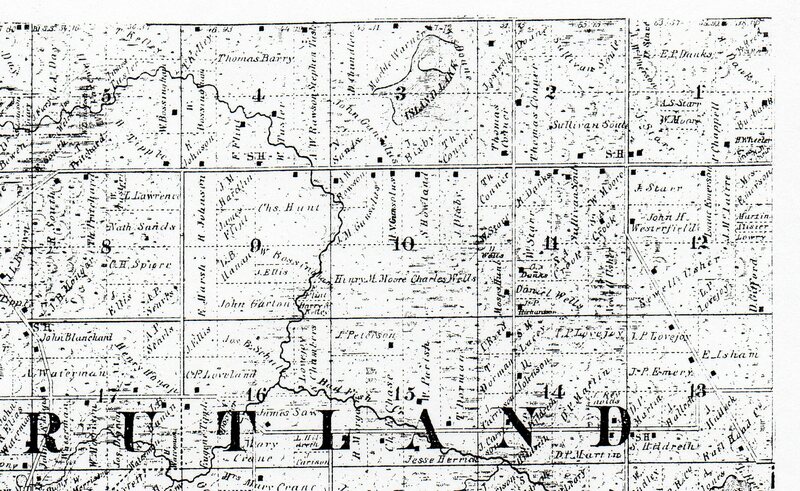 They settled on a farm on Section Two, Rutland Township, just east of Stoughton and south of Madison. Joshua died 20 March 1894 and Rachel 16 September 1887. George attended common schools, and he spent his boyhood and youth after the manner of most farmers’ sons, becoming familiar with the various employments of rural life. 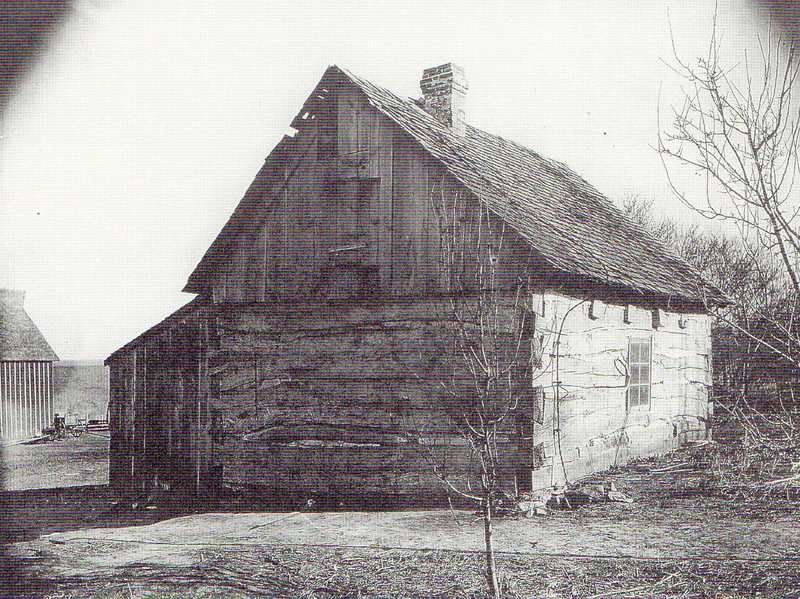 Upon reaching his majority he began farming for himself not far from the old homestead (farm). 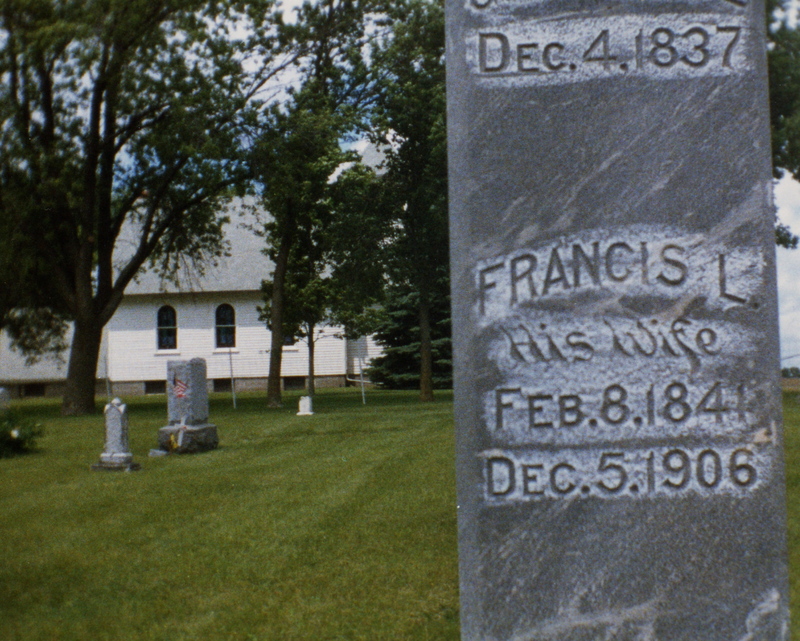 He married on 28 February 1859, at the age of 21, to Frances Lucinda Wheeler, age 18, at Dunkirk, Dane County. 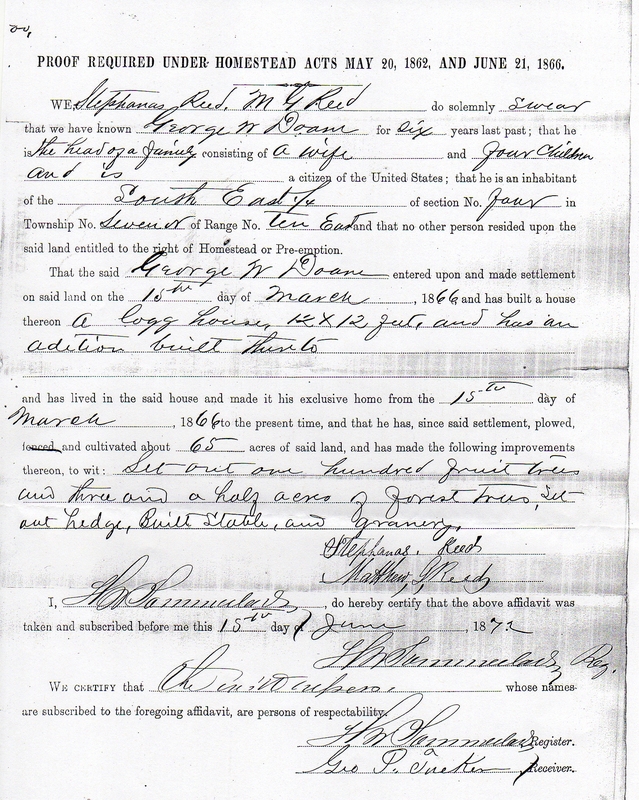 Frances’ parents had removed from New Hampshire to settle in Dane County in 1853. Between 1860 and 1874 they had eight children. The first and second were born in Dane County and the remainder were born in Otoe County Nebraska. 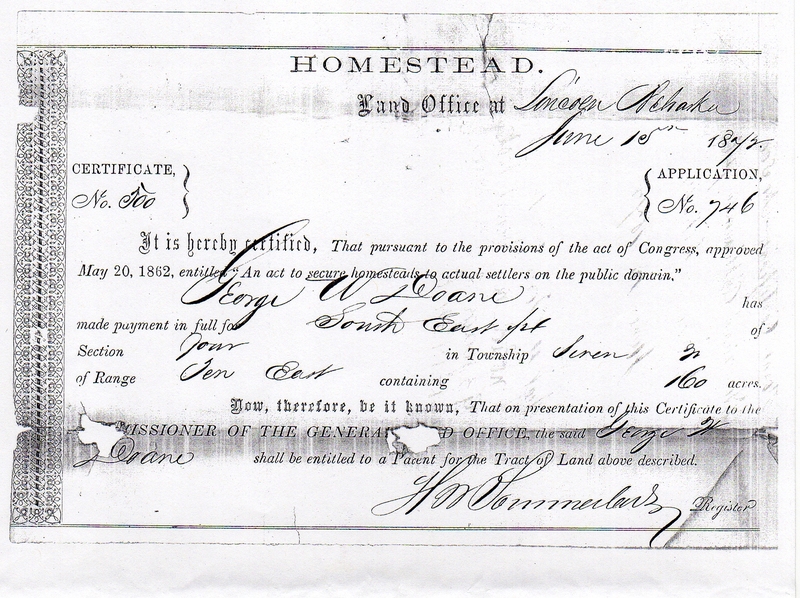 George applied for a homestead, Application No. 746, at the Land Office at Nebraska City on 16 February 1866. The total fee was $18.00. This homestead was across the road from property owned by Mathew Gooding Reed. 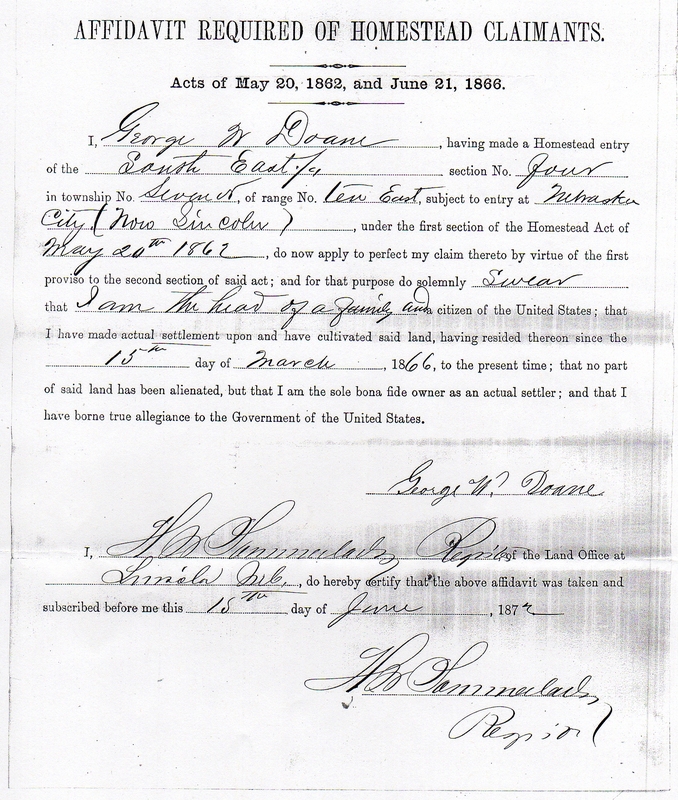 PROOF REQUIRED UNDER HOMESTEAD ACTS MAY 20, 1862 AND JUNE 21, 1866. WE, Stephanas Reed, Matthew G. Reed do solemnly swear that we have known George W. Doane for six years last past; that he is the head of a family consisting of a wife and four children and is a citizen of the United States. That the said George W. Doane entered upon and made settlement on said land on the 15th day of March, 1866, and has built a house thereon a log house, 12 x 12 feet, and has an addition built thereto and has lived in the said house and made it his exclusive home from the 15th day of March, 1866, to the present time, and that he has, since said settlement, plowed, fenced, and cultivated about 65 acres of said land, and has made the following improvements thereon, to wit: Set out one hundred fruit trees and three and a half acres of forest trees, set out hedge, Built Stable, and granary. George has brought the entire tract to a productive condition, planted a grove of cottonwood trees, and has an orchard three acres in extent, besides the smaller fruits. The land is watered by a living stream, (Muddy Creek) and stocked with good grades of cattle, horses, etc. He purchased the additional 120 acres in the spring of 1883. He is fond of fine horses, and he has an interest in the valuable full-blooded Norman “Romulus” imported. Thus George secured a Homestead, Certificate No. 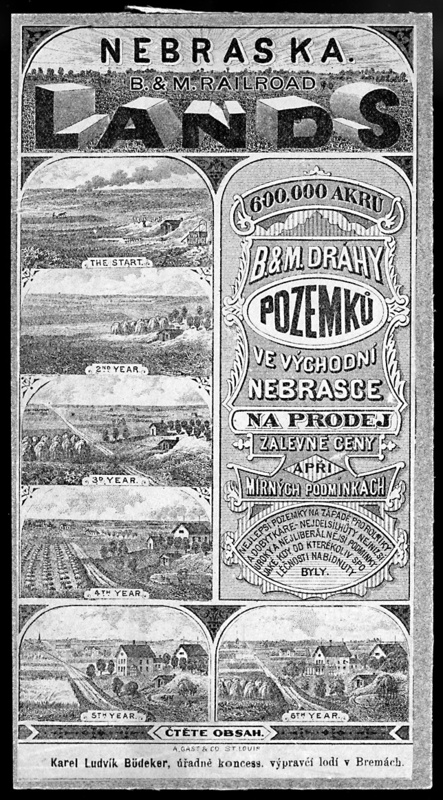 500, from the land office at Lincoln, Nebraska. 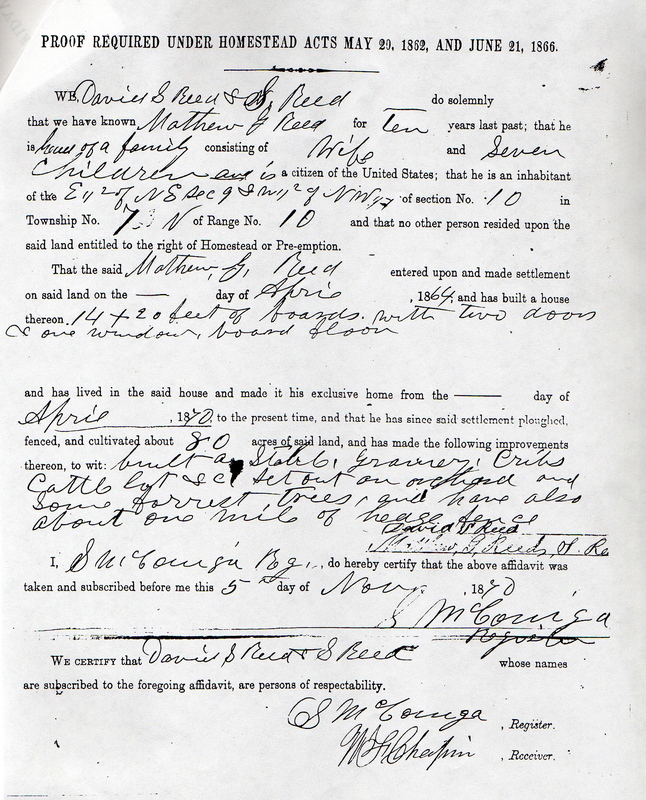 The certificate was delivered to him on 5 May 1873. 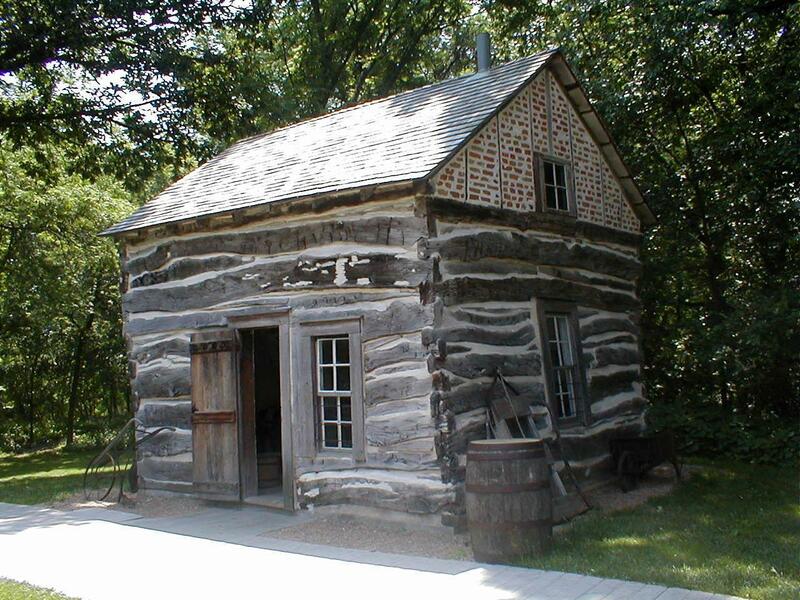 “The George Washington Doane family, the third settlers of the area, were the only family to use logs in the building of their home. A few years later this home burned down and was replaced by the present house. 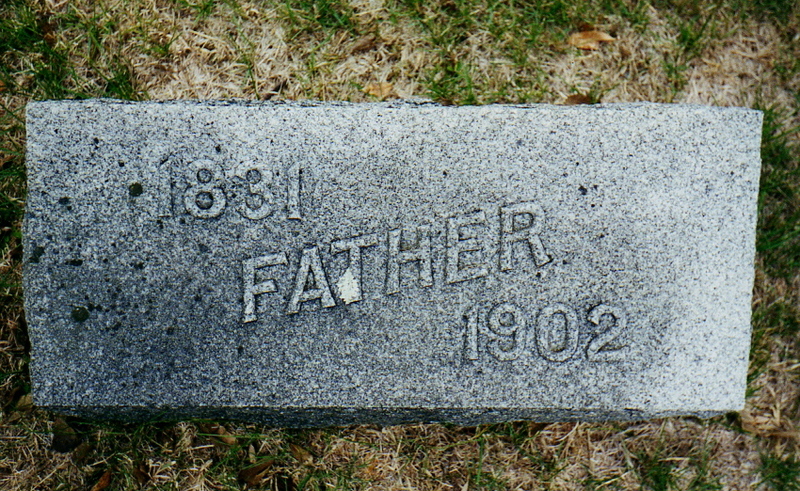 He was director of his school district, 1870-1874, with his Post Office address at Nursery Hill. 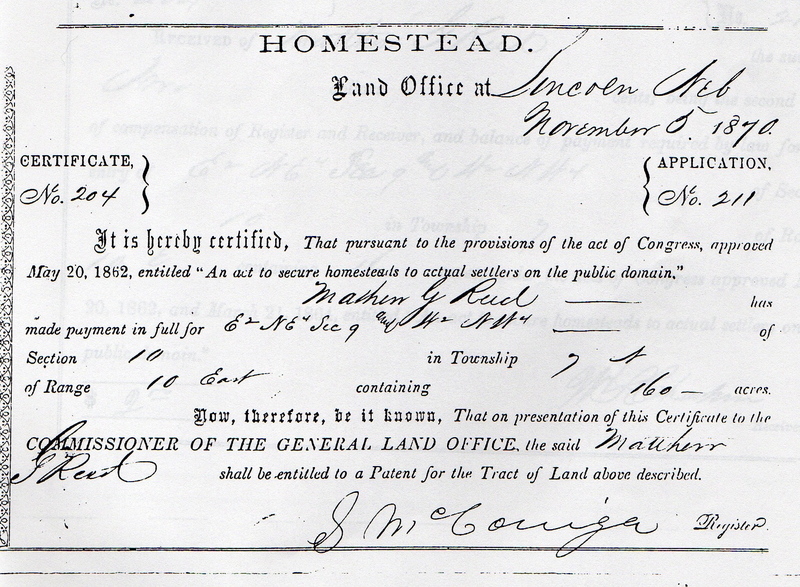 The homestead of 160 acres of land was valued at $2,000.00, of which 50 acres were under cultivation. His farm implements were worth $150.00. His livestock, valued at $450.00, consisted of five horses, three head of cattle including two milch (sic) cows, and three hogs. 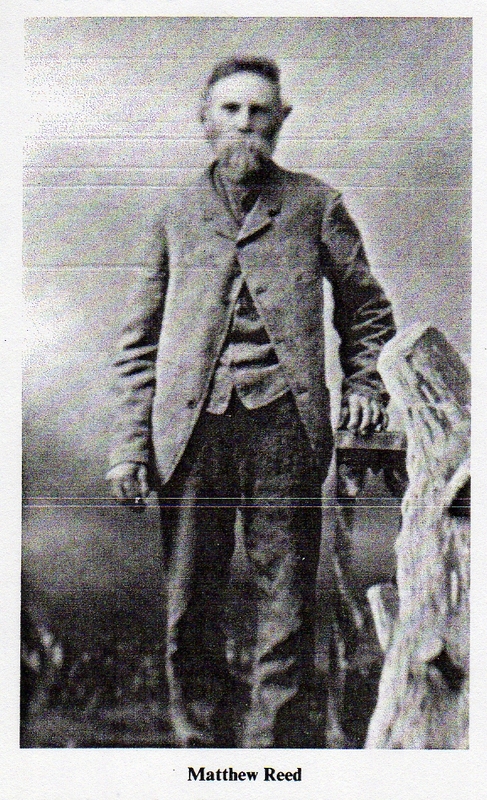 In 1869 he had raised 250 bushels of wheat, 100 bushels of corn, 80 bushels of oats, 50 bushels of barley, 100 bushels of potatoes and had put up 10 tons of hay. The family also had sold 3000 pounds of butter during the year. He purchased the additional 120 acres in the spring of 1883. The farming and stock-raising interests of Otoe County have a lively representative who now owns 280 acres of fine land on the southeast corner of Section 4, South Branch Precinct. He evidently has made the most of his experiences as an agriculturist, and in reward for his thrift and industry is surrounded by all the comforts of life with many of its luxuries, and with an ample competence for his old age. 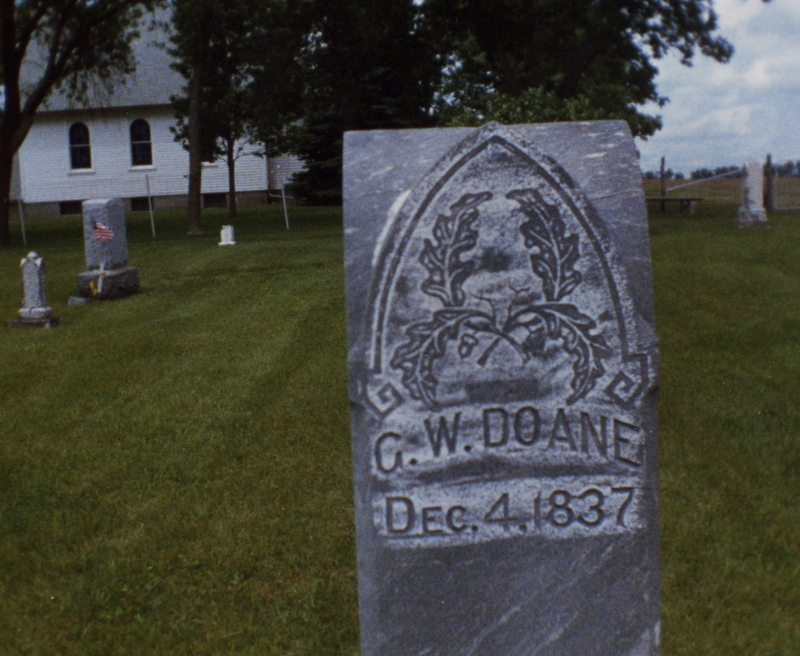 “In 1894, Mr. Doane moved to Cedar County, Nebraska, where on December 5, 1906, his wife preceded him into the beyond, since that time he has made his home with Charles, at Cottonwood, South Dakota, until death called him hence, Oct., 14th, 1909, being at the time of his decease, 71 years, 10 months, and 10 days old. 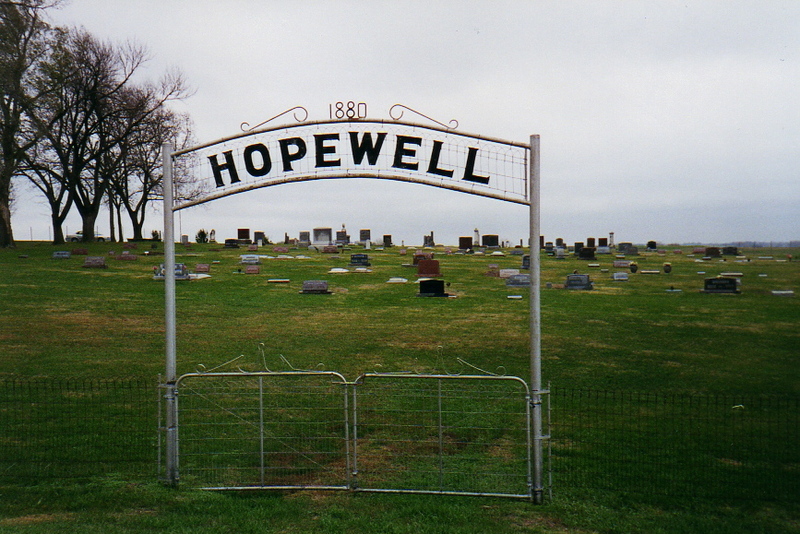 “The body will be shipped and interment made in the cemetery of the Hopewell church, in Otoe County, Nebraska, beside his wife. 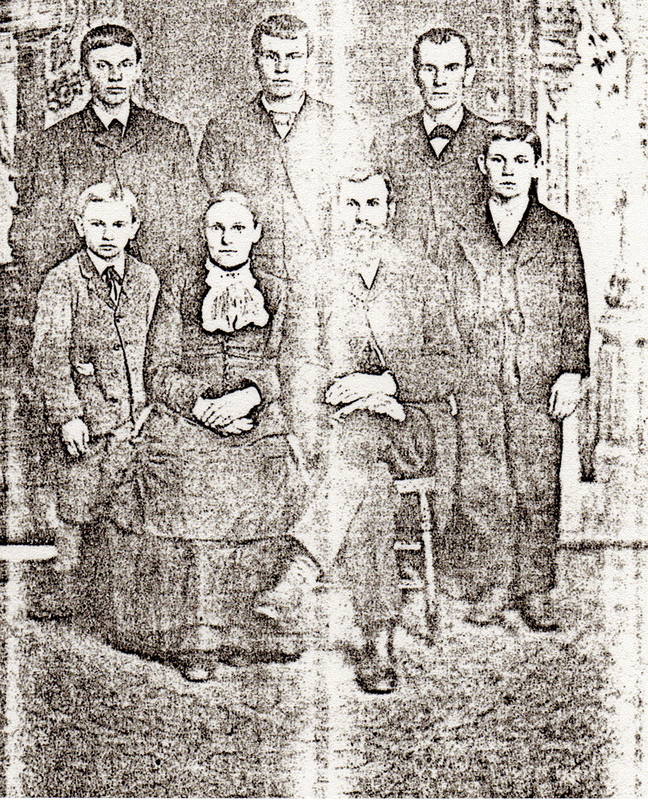 Their first born, Arthur Nelson Doane (#918), Eunice’s Great Grandfather, married Jane R. Reed on 25 December 1883, at the bride’s father’s home, Mathew G. Reed. Officiating was T. D. Davis and the two fathers were witnesses. 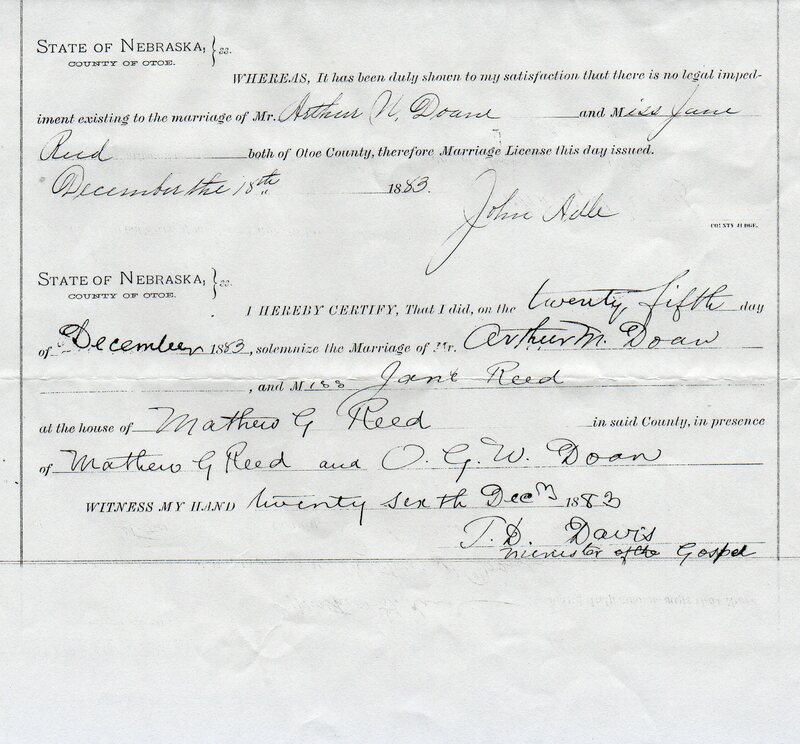 Matthew Reed being duly sworn, says that there is no legal impediment existing to prevent Mr. Arthur N. Doane of Otoe County, Nebraska aged 22 years, born in _______ County, State of Wisconsin, the name of his father being G. W. Doane, and the maiden name of his mother being __________ and Miss Jane Reed of Otoe County, Nebraska aged 21 years born in Mills County, State of Iowa, the name of her father being Mathew G. Reed, and the maiden name of her mother being “Ruthan” Smith, both white in color, from entering into the Marriage contract and that both are of sufficient age, in law, to contract marriage. 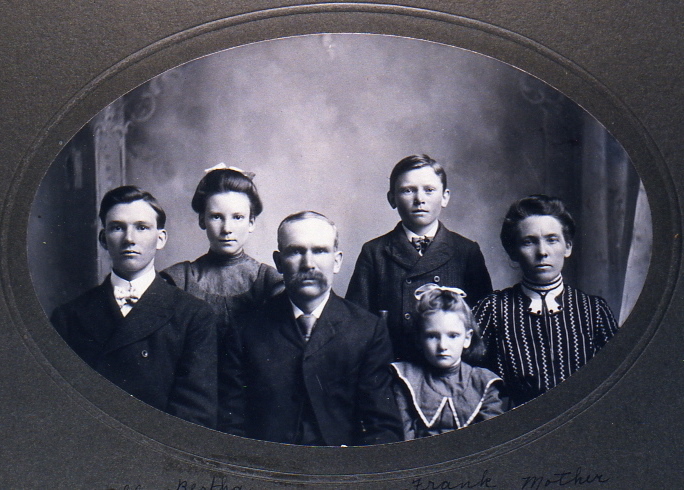 Alfred, Bertha (Eunice’s Grandmother), Arthur Nelson, Frank, Essie and Jane Reed Doane. “These early settlers endured many hardships such as droughts, storms, and grasshoppers. During the 1870’s the grasshoppers came. The men were in the field harvesting spring wheat. The corn was good size. The grasshoppers left the fields barren in a short time. They ate almost everything in sight, including things made of wood, also clothing. When they had eaten their fill, they departed, darkening the skies as if clouds had suddenly come between the sun and the earth. the women, many of the women dressed in men’s clothing and carried guns, while the men were away. “Stephanus Reed told of one occasion in which he met an Indian hunting deer. The Indian seemed very friendly and gave three large chunks of the deer he has killed. The Indian then asked him where he lived. Mr. Reed said “Oh up North a ways”. Mr. Reed feared he might return in the night and attempt to steal something, or attack him. “He stayed on guard all night, but no Indians appeared. Because of various encounters with the Indians, Mr. Reed has a habit of walking a short distance and stopping and looking behind to see if he is being followed. He continued this habit until he died -, which was many years after the Indians had been driven out. “The roads were mostly trails which followed fairly close to the creek. The creeks were forded at convenient places. Most of these trails were feeder roads connecting with the Oregon and Overland or Mormon Trails. 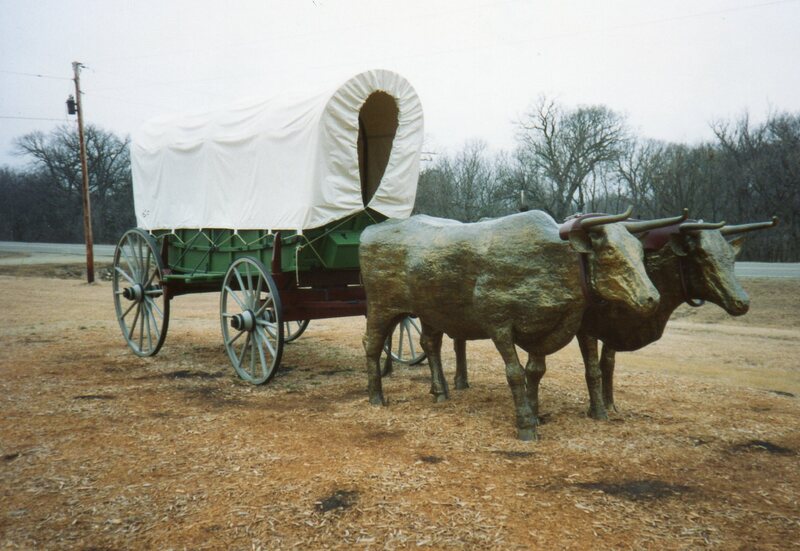 Mr. Maller drove a freighting wagon pulled by a team of oxen, between Nebraska City and Denver. 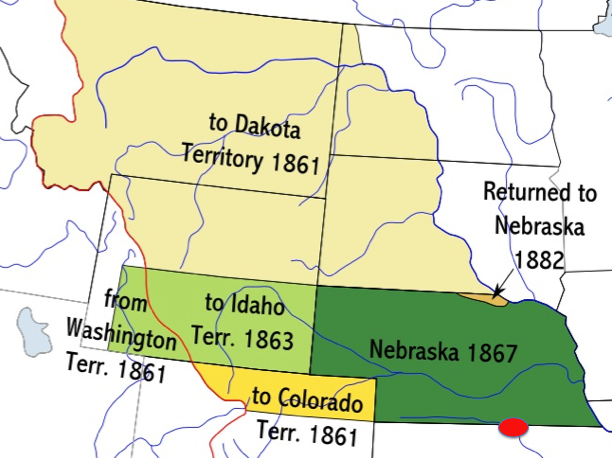 He undoubtedly crossed thru this District, since the Nebraska City cutoff was the road he followed to connect with the Oregon Trail. He tells of encounters he had with the Indians. Only three or four trips could be made during a year. 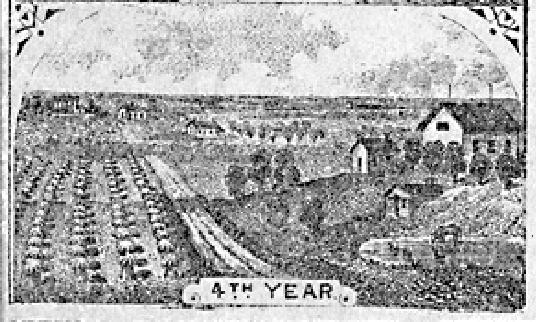 “Herds of cattle were also driven along these trails to markets, which were located at St. Joe and Omaha. “The oldest landmark was the Reed’s home. 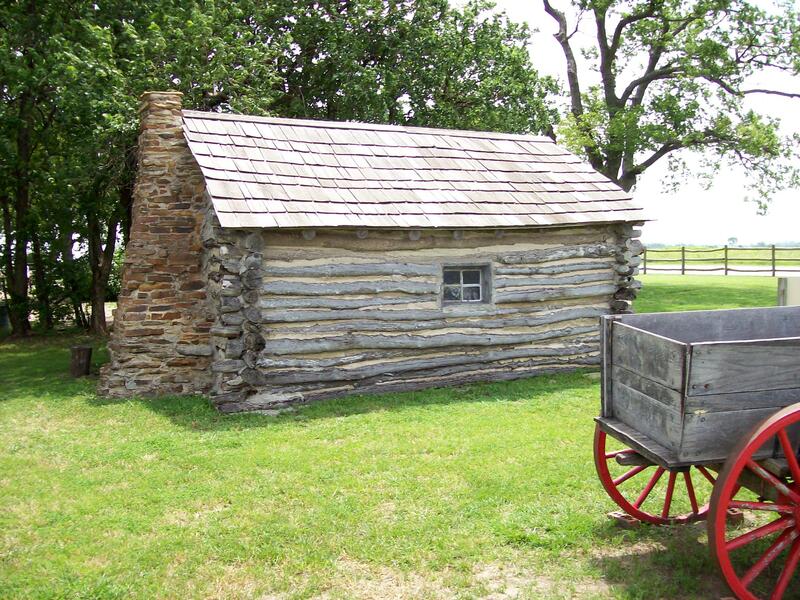 Here also was a tree planted by Stephanus Reed, which he brought from Ohio, in the covered wagon. 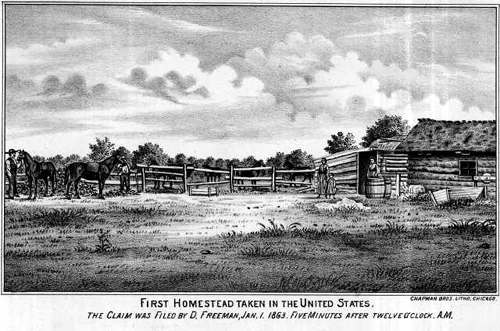 1863 First Homestead – filed by Daniel Freeman, five minutes after midnight, January 01. 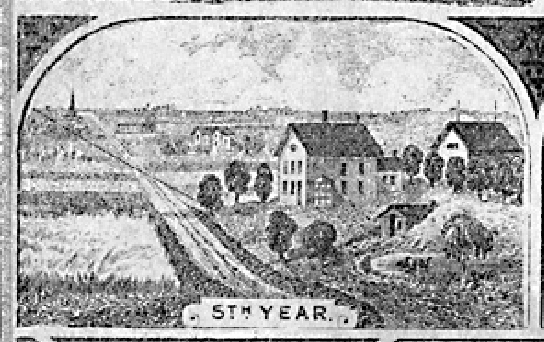 1874 – people of Unadilla built a stockyard for the Burlington and Missouri River Railroad. This was also the year of the locust invasion. 1876 – people of Unadilla built a railroad station. 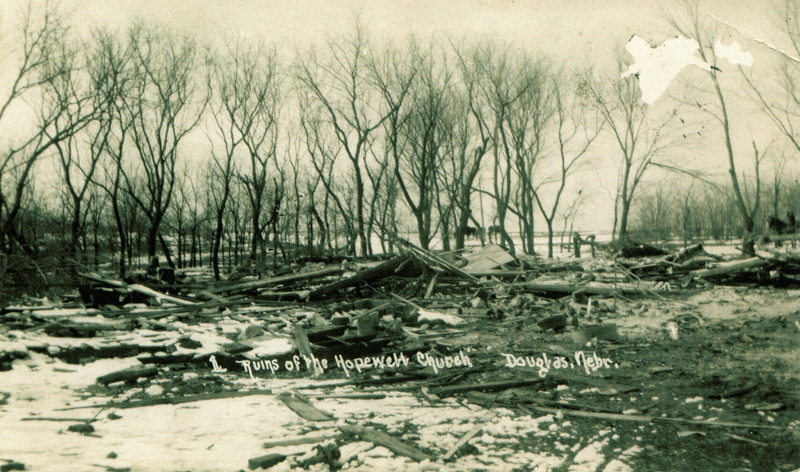 1913 – Tornado at Hopewell. This is a postcard photograph sent by a relative to my great grandmother Jane Reed Doane then living in eastern Montana.